International Symposium on Marine Natural Products presents the developments in the chemistry of soft corals. This book provides information on several relevant topics, including the chemistry of sponges, metabolites, biomimetic synthesis, and aplysiatoxins. Organized into five chapters, this compilation of papers begins with an overview of the biogenetical origin, distribution, and biological significance of Alcyonaceans. 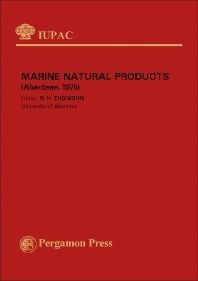 This text then examines the constituents and structural features of marine sponges. Other chapters consider the biosynthetic pathways to several halogenated marine natural products, which are based on bromonium ion. This book discusses as well the apparent isomerization of the aplysiatoxins during chromatography. The final chapter deals with the natural product research on marine organisms found in Australia. This book is a valuable resource for marine scientists, oceanographers, biologists, marine pharmacologists, chemists, and research workers.